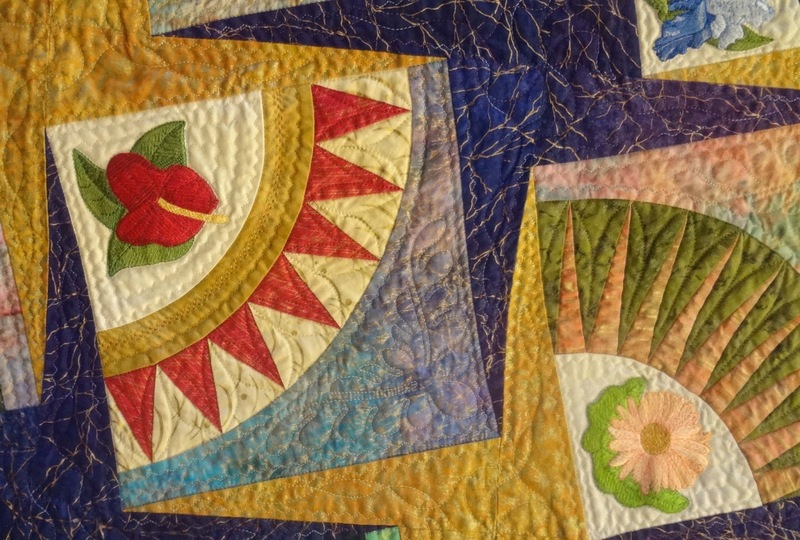 My friend Tere D'Amato and I drove up to pick up her quilt on Sunday (which won a blue ribbon!) to check out the show and see the vendors. A smaller show in general, and to be frank, it was nice to see a more, manageable show instead of a huge national one... to put it simply-- so nice to see what the locals are up to-- and believe me, they are doing plenty! So, of course we start with Tere, and her fabulous "Liberty Day." Tere does not consider herself an artist, more railing on that some later time, but and after winning the blue ribbon for "Artistry," she still does not consider herself an artist. Go figure. 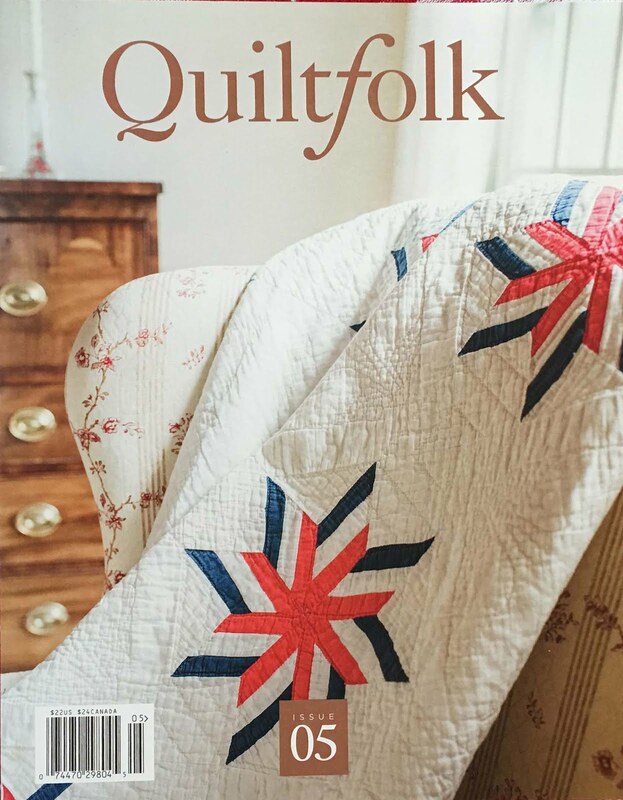 Anyway, Liberty Day won "Best in Show" at the Bayberry Quilter's of Cape Cod show as well and I do hope you will have a chance to see it in the near future. If you do, make sure you have the white glove lady show you the back... San Francisco Stitch Co. is proud to have personally embroidered the label. 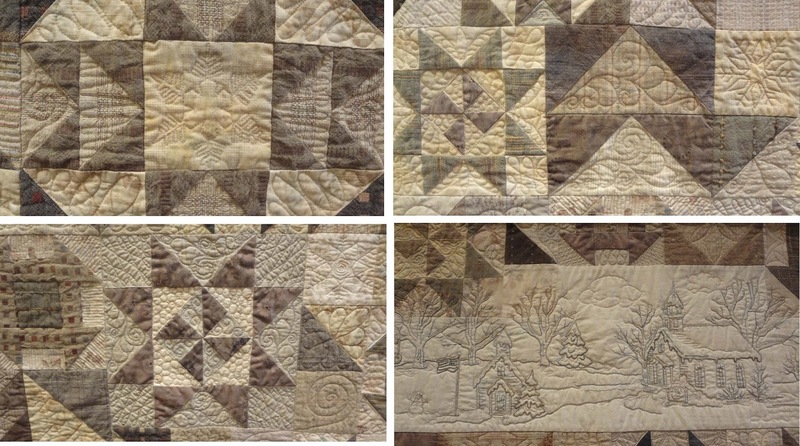 Obviously Liberty Day is my number one, but here are some of my other favorites-- I apologize for my detail shots, but whole quilts can get very overwhelming, as anyone who's been to these shows knows! G. Wong, "I Love, Love, Love" Me, too! Not only a labor of love for all of the quarter square triangles, but the swirls are so perfectly placedand give such an illusion of motion-- almost looks like paints have been smeared! You have to look twice to make sure none of that piecing is curved. Janet Elia, " Winter Days in Shades of Taupe." 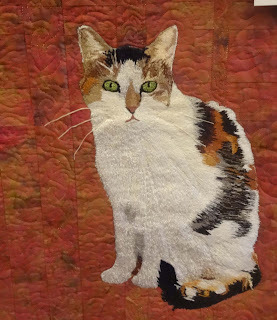 This is a kit, I believe, from Crabapple Hill Designs. It has embroidered line winter scenes in the border and stars, or "snowflakes inside. What I love is how this person had so much fun with the quilting-- every shape had something wonderful in it-- swirls, snowflakes, and some really offbeat patterns. She totally made this kit her own. Alice Means, "Floral Beauty." 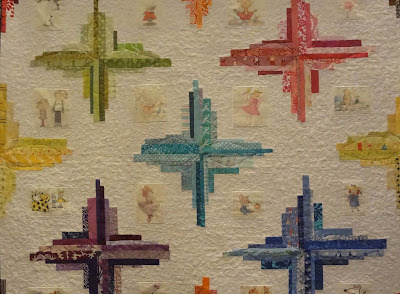 Beyond the hand embroidery, I was so happy to see many people adding machine embroidery to their quilts. What's not to love about that! 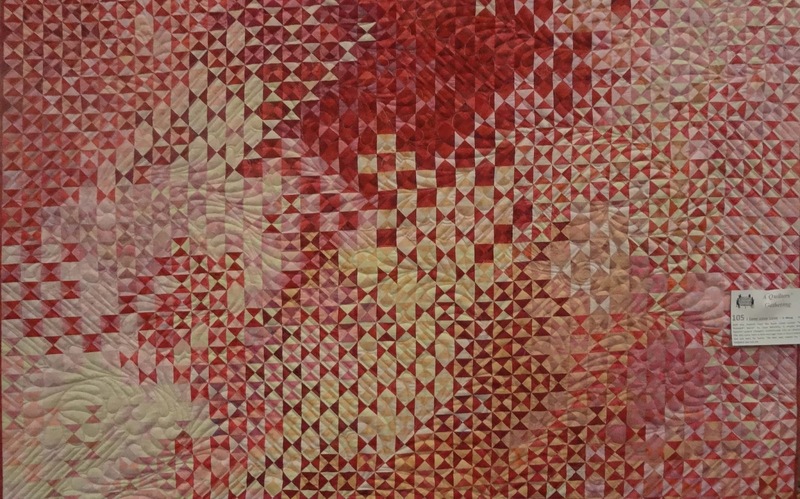 The quilt above was just one example of embroidery and piecing, one complimenting the other. I'd like to see the designers get more credit-- you have to credit a quilt a kit designer when submitting, but I really didn't see any information up front on where these embroidered flowers came from. 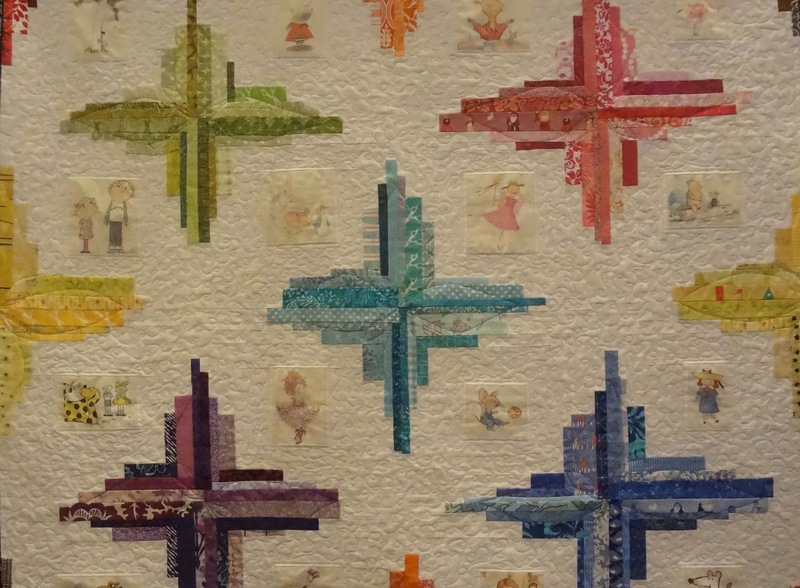 This is a sentimental favorite for me-- a modern quilt, but the maker put pictures of her daughter's favorite book characters in each white space-- since my youngest daughter left the nest for college this fall, definitely some sniffing was heard. Sorry-- I didn't see the name/artist of this in the show booklet. Claire Watts, Flowers in Urn with Frame. 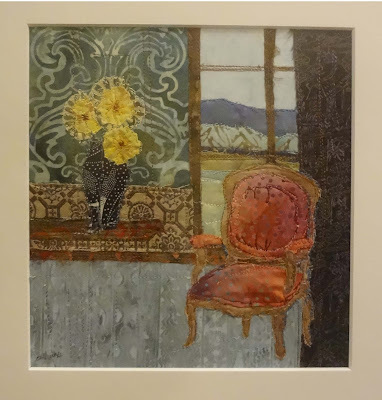 This little framed piece took my fancy-- simple and sensational. Want to pull out a book and have a read in that chair right now. A gem. Jody Scaltera, "Ping." And finally, as a cat person-- here's a thread painted one-- amazing. If thread painting was as effortless as this made it look-- we'd be out of business!